Impulse Engine Technology is excited to introduce Negative Pressure Supercharging a revolutionary new clean burn Homogenous Thermal Charge Spark Ignition (HTCSI) supercharging combustion process that substantially improves torque, acceleration, towing, fuel mileage and emissions of OLDER and NEW vehicles from carburetion, fuel injection, gas to diesel. Negative Pressure Supercharging (NPS) does NOT use air pumps or complex parts. 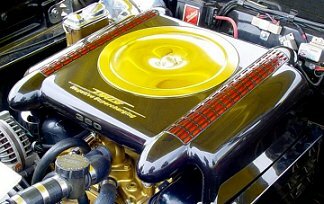 Instead NPS uses a unique combination of mechanically simple parts and highly advanced processes such as Compressed High Velocity Exhaust Gas (CHVEG) and Synchronised Valve Timing (SVT) to supercharge the engine and substantially improve fuel mileage and emissions. CHVEG produces a super vacuum which pulls a larger intake charge into the engine while SVT traps the super vacuum in the cylinder during the exhaust stroke and moves it to the intake stroke during the overlap period. This allows the super vacuum to pull a larger intake charge into the engine BEFORE the piston pulls the intake charge into the cylinder. The super vacuum also creates a much greater pressure difference between the cylinder and atmosphere which produces such violent air turbulence it creates a homogenous intake charge. By increasing the air induction temperature to 40-80°C (105-175°F) it causes the homogenous intake charge to increase the speed of combustion to just BEFORE the point of self ignition. To prevent self ignition the water temperature is reduced to 43-50°C (110-122°F) in conjunction with less ignition advance and cold spark plugs. Despite the cooler water temperature the engine and combustion run hot, only the water passages run cooler. This produces a very fast and clean burn that is controlled mechanically. 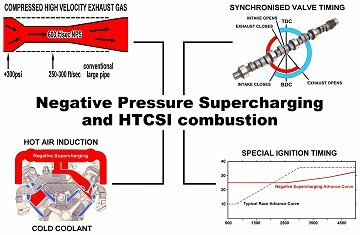 As a result NPS and hot air induction produce a Homogenous Thermal Charge Spark Ignition (HTCSI) supercharging combustion process that substantially improves engine and combustion efficiency. Because NPS and HTCSI combustion is controlled mechanically it allows this new supercharging combustion process to be easily applied to older and new vehicles from carburetion, gas to fuel injection using bolt-on kits. NPS and HTCSI combustion can even be applied to diesels using bolt-on kits but the process uses compression ignition instead of a spark. HCCI combustion increases the speed of combustion to the point of self ignition using a naturally aspirated homogenous intake charge and hot air induction which is controlled by computers and mechanically complex parts. However, HCCI combustion has a number of drawbacks that make it very expensive and impractical for use in motor vehicles. For example, HCCI combustion works at ONLY one throttle position and one rpm while at all other throttle positions and rpm the engine uses normal poor combustion. Also, HCCI combustion is very difficult to control, does NOT work without computers or mechanically complex parts, does NOT work with older engines or diesels and does NOT supercharge the engine or increase fuel mileage by 30% like NPS and HTCSI combustion. Therefore, NPS and HTCSI combustion is a far more advanced and affordable technology that can be applied to OLDER vehicles using bolt-on kits and to NEW vehicles during production to substantially improve power, fuel mileage and emissions over conventional or other technologies.